Screenshot of the week: Purdue was VERY lucky to get out of this game relatively unscathed. 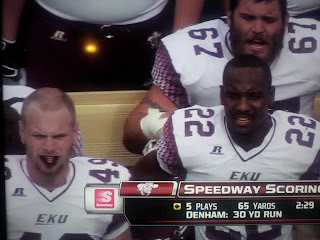 Check out the lower left portion of your screen right after Eastern Kentucky scored their touchdown. It's the JOKER! 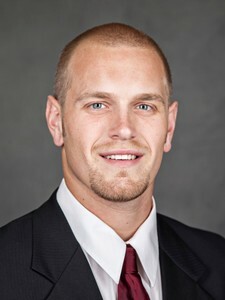 In reality, that's tight end, Paul Henry. And as you can see below, he's normally a regular looking dude. However, whatever the hell he had going on with his lips on Saturday was enough to make me consider sending out the bat-signal. Announcer complaint: It was a Glen Mason lovefest in the booth, as every positive yardage play was "straight out of Glen Mason's playbook!" Remembering Glen Mason from his Minnesota days, I'm just glad none of our defensive plays were straight out of Glen Mason's playbook. Thing I learned from BTN: This was nearly a complaint until I looked it up online and found out it was true. The pronunciation of Kawaan Short's name is now apparently KAY-won. And credit BTN for getting it correct. Still don't believe me? Here's the official game notes (check out page 3). If I had to guess, Kawaan finally brought it up this year. Last year's information guide (page 15) doesn't mention anything about his name in the same section, and I'm pretty sure NOBODY would have pronounced his name like that! Irrelevant Comment of the Week - Wife Edition: I made the mistake of telling my wife she could get a comment into the recap if she said something irrelevant and humorous. So she spent the entire game coming up with one-liners that were mildly humorous, but you could tell she was trying too hard. I've told her the feature is getting cut, so now maybe she'll go back to making actual funny irrelevant comments again. Meanwhile, she did spend the whole game praying that some guy named Sanders played for the Colonels, and sure enough, Jared Sanders got his name called by returning 3 kickoffs. Thank you Colonel Sanders for making my wife's day. I had to take a closer look on my laptop, but it looks like Henry's Joker face is due to his mouthguard. Could be...still looks scary though!